For installation operating status and inclement weather updates, click the above link. UNLESS CONTACTED BY YOUR CHAIN OF COMMAND, USASOC OPERATES FROM THE FORT BRAGG INSTALLATION STATUS. Please contact your chain of command for further guidance. For the latest USASOC guidance and news, please click here. 528th Sustainment Brigade (SO) (A) provides enduring logistics, signal support and medical care to Army Special Operations Forces and joint elements worldwide IOT enhance the Global SOF Network. In October 2001, 150 Soldiers of the then-Special Operations Support Command (Airborne) were among the first deployed in support of Operation Enduring Freedom. Since that time, the unit's Soldiers, known as "Sentinels," have continuously deployed in support of overseas contingency operations embedded with other U.S. Army Special Operations Command (USASOC) comrades in arms around the globe. Since 9/11, about a third of the brigade's 800 Soldiers are deployed in small teams around the world. The Sustainment Brigade's support to overseas contingency operations provides unique skillsets and valuable support assets to Special Operations Forces in defense of this nation. The brigade, based out of Fort Bragg, N.C., is task organized with a brigade headquarters, the 528th Special Troops Battalion (STB), and the 112th Signal Battalion. In addition, the brigade maintains a permanent presence in each theater, with ARSOF Liaison Elements (ALEs) based at each Theater Special Operations Command (TSOC) and Army Service Component Command (ASCC) headquarters, and a Signal Support Detachment (SSD) at each TSOC. 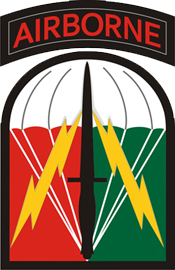 As a forward stationed element of the brigade, Soldiers from the ALE are capable of providing persistent and direct support to the TSOC through planning and coordination with the Special Operations Command, the Army Special Operations Command, and the Army Service Component Command in direct support of operations and training. The Brigade Support Operations Section has the ability to deploy our Support Operations (SPO) capability in support of Special Operations Forces worldwide. The SPO capability can co-locate with a Special Forces Group Support Battalion, an Expeditionary Sustainment Command, and Theater Sustainment and ARSOF with a centralized and integrated in-theater presence for sustainment support. The organic capabilities of the 528th SB include the Special Operations Resuscitation Teams (SORT). The SORT is a robust medical team that is capable of providing expeditionary, combat health support along with prolonged field care through CASEVAC of opportunity. The support team comprises a combat resuscitative team with a flight surgeon, emergency nurse, and 3 special operations combat medics. They provide advanced trauma and resuscitative care with holding and CASEVAC management. The SORT is conceived as being adaptive and modular to provide forward support for SOF in austere locations. In addition, there are two National Guard companies force-aligned to the STB. The 195th Forward Support Company (Nebraska) and 197th Special Troops Company (Texas) are capable of providing Army Special Operations Forces and Joint Special Operations Forces dedicated logistics capabilities when mobilized. As the only Army and Special Operations Airborne Signal Battalion, the 112th Special Operations Signal Battalion provides Theater Mobile Strategic SOCOM Entry Points (MSSEP) and Global Network Operations to support ARSOF. The battalion deploys scalable teams capable of providing worldwide, responsive and reliable airborne capable mission command platforms in support of Special Operations Forces and Theater Special Operations Commands. The forward stationed Signal Support Detachments (SSD) provides a vast array of communications capability to each TSOC. The 112th Signal Battalion strives to continue to lead the way in SOF communications and training of both CONUS and deployed ARSOF elements worldwide. The 528th Sustainment Brigade (SO) (A) embodies its motto of “We Support to the Utmost,” providing the means to effectively and efficiently coordinate, synchronize and integrate logistics and signal support for ARSOF units and operations worldwide.